According to Zillow, certain hues may lead to higher values. According to Zillow, homes with pale blue bathrooms fetch a higher average selling price than white. A fresh coat of paint is often a simple solution to making a home more attractive, and a recent analysis by Seattle-based real estate marketplace Zillow reveals that the right color might also improve your home’s value. 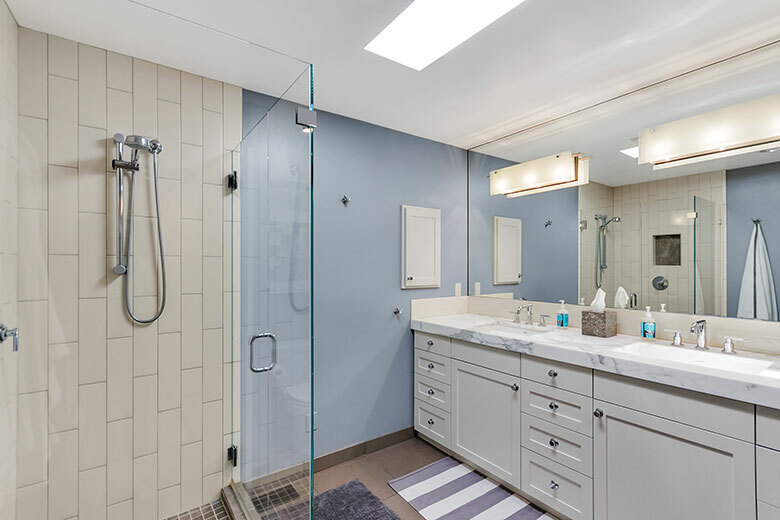 By analyzing more than 32,000 listing photos of recently sold homes across the nation, Zillow found that houses with pale blue bathrooms sold for $5,440 more compared to similar homes with white bathrooms (a decent return on the cost of a can of paint and a little labor). Blue in other rooms also correlated to an increased value compared to white-walled homes: Houses with soft gray-blue kitchens sold for $1,809 more, and houses with cerulean bedrooms sold for $1,856 more. But blue—and grays with blue undertones—aren’t just being used on existing homes. Windermere Bellevue West broker Randy Ginn, a certified new construction specialist who represents many newly built properties on the Eastside, says these colors add a modern, polished look to the homes being built in the area. These light hues are best when paired with splashes of vibrant colors in strategic places. Colors such as turquoise and cherry red on front doors are accents that increase street appeal and catch the eye in listing photos. Chris Doucet, the managing broker for Realogics Sotheby’s International Realty and a former interior designer, notes: “With the booming economy, people are riskier with colors, and it reflects a sense of optimism.” These pops of color against neutral tones paint a bright future for sellers—and buyers. A turquoise shade can catch the eye of potential buyers; red pops play well off of blues and grays, too. Kerrie Kelly, Zillow’s home design maven, offers a few tips for sellers. Neutrals, such as gray and blue, not only snag online viewers, but have the visual effect of making spaces look larger—always a plus when selling a home. Zillow’s study found that “greige” (a mix of gray and beige) exteriors sold better on average than houses with brown or stucco exteriors.